We offer a full range of bone and antler combs, and cases, from the early medieval period. We can use either bone or Red deer stag antler for your comb. The vast majority of combs discovered at York, and most other 9th-11th century early medieval sites are antler, a noted change from the 6-8th centuries where bone was also commonly used. When finished the two look remarkably similar, so we recommend for display and museums that bone is used, as this significantly reduces the cost. However, if the comb needs to be more hard-wearing, or if accuracy is key, and cost not a factor, then antler is the ideal material, as it is stronger. The simplest examples of our combs in bone start at around £75-80, but additional details, fancy examples, cases, or using antler will increase the price, so drop us an email for a no obligation quote for the item you want. Above you will see an example of a comb commissioned from us for public use and display. This example has thickened comb teeth for extra strength when handling. We are always happy to tailor objects to an accuracy level suitable to you. Whether that be museum grade replica, or with concessions to accuracy for the sake of practicality and safety, especially if these objects are to be used with schools groups and public displays in mind. After all, we are using these objects for a different purpose to the originals, and the key thing is that they provide value and enjoyment. 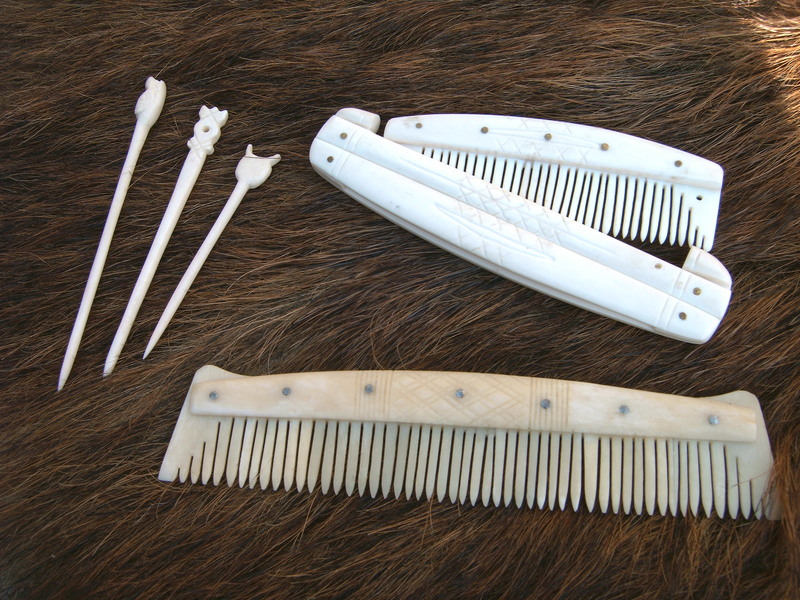 Below are examples of finished combs (and three pins), we use bleached bone which is a clean safe material. The pins and cased comb are bleached bone as it is, the lower example has been treated afterwards with vegetable oil to restore some of the original colour and patina, but the choice is entirely up to you. Below are some example of comb types and patterns, and their dates. If you wish to refer to a specific comb, we have provided a unique name code (in brackets after the object) so you we can be certain we are talking about the same object. The first two letters are unique to the site the artefact is copied from, the third letter denote the material you wish us to use A= Antler, and B= Bone, and the final number is unique to that design. Hello, I would like to buy a bone comb and case. How much would this be? Replied to you via email Glenn, thank you for the inquiry! I’m interested in a comb, can you give me a quote please? Also for the antler too. Replied to you via email Mattheiu, all costs are usually worked out as they vary from comb to comb, depending on size, decoration, and material, and where you want it posting, so its hard to give an accurate cost. The YOB6 tends to be around £75 for bone, plus postage for a point of reference.